Company profile, Latco International Inc.
Latco Mexicana has assembled the best selection of back-up batteries from diverse suppliers all over the world. 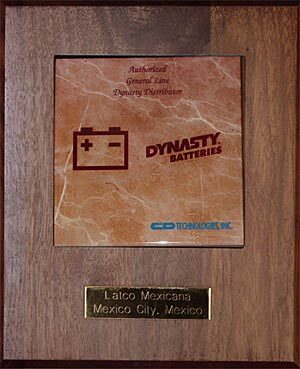 C & D Technologies, the main US battery producer has appointed Latco International as one of the distributors for the caribbean and latinamerican countries, as shown by the recognized distributor plaque appearing here. Our purpose is to solve the need to maintain the constant supply of electricity required by our customers equipment providing state of the art back-up energy equipment. We deliver tailored energy back-up solutions for every need analyzing the particular requirements in a case by case basis and applying our product and technical knowledge to match the need to the best available solution. We look to the future from the perspective of an agent of change, we pride on our work and our global vision and believe in constant growth as the basis for providing our shareholders, business partners and employees a return for their trst and efforts.